My word for 2019 is Inspiration. I intend to look for it everywhere, every day. And I plan to share what I find with you every so often, whether that’s through a picture, a post, or simply an uplifting quote. This morning, such a silly thing got me thinking about inspiration and happiness. My binder clip stash had run low, so I went to my supply drawer to get more. I found the ones you’re looking at in the photo. The minute I saw them I felt happy. I love color. There’s one shade of purple in particular that, when I look at it, literally fills me with a sense of happiness. Whether it’s in art or clothing or office supplies or. . . I could go on and on and on. . . pretty colors inspire me, lift my mood, and make me ready to get up and go. 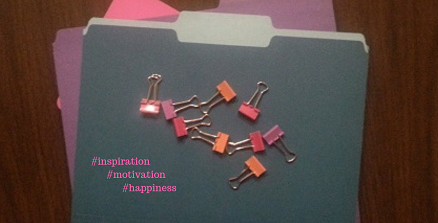 What motivates and inspires you and makes you happy? Color? Sunrise or sunset? The cuddliness and comfort of your favorite sweater? Music? A special song? A religious verse? Writing the perfect sentence? Acing a test or completing the Sunday crossword puzzle? Coming up with the perfect proposal—for a book submission, a board meeting, or a marriage? Making the yummiest pasta sauce? The most intricate model automobile or ship? The awesome-est Halloween costume in your first-grader’s class? Chances are you have many things that motivate and inspire you, too. Think about it. Make a list. Then pick one item to look at, listen to, or begin.